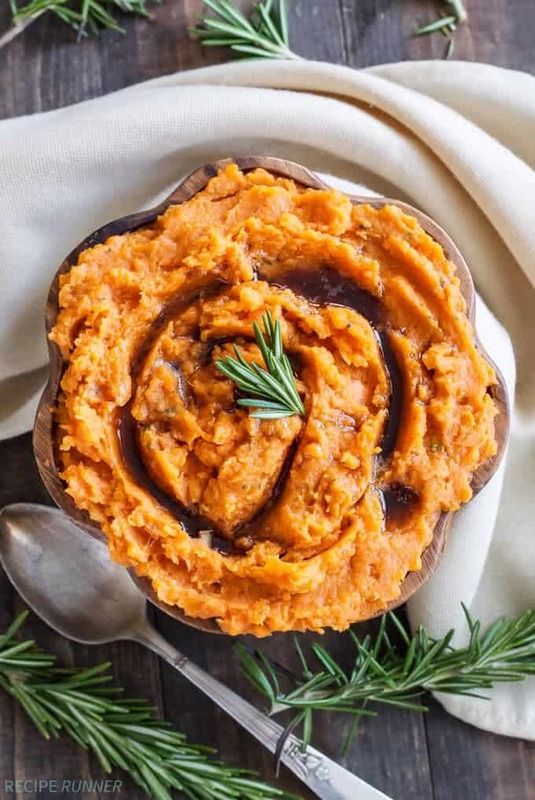 Four ingredients are all you need to make these delicious savory inspired brown butter and rosemary mashed sweet potatoes! We’re officially t-8 days until turkey day, who’s getting excited?! I know I am! 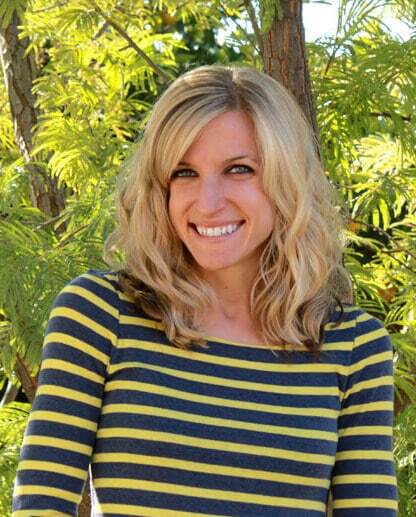 Danae here from Recipe Runner and as always I’m thrilled to be back with all you lovely Spoonful of Flavor readers! 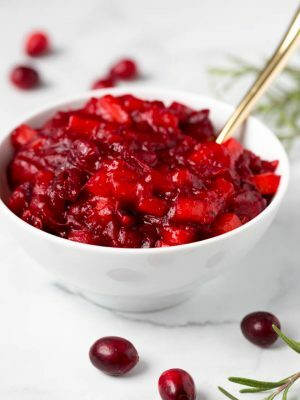 I’m sure many of you are starting to finalize your Thanksgiving menu or maybe you’re like me and you think you have it finalized and then you find 10 more recipes you want to try. Well I’m here today to add one more recipe to your menu and trust me, you are not going to want to pass this one up. 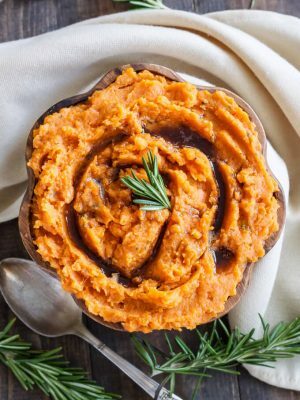 Brown Butter and Rosemary Mashed Sweet Potatoes need to happen at your Thanksgiving this year and it’s the one side dish I can say that I have 100% decided that I will be making! Deciding what I’m going to make for the big dinner is probably the most stressful part of the holiday for me, well that and the crowded grocery store. Being a food blogger along with the desire to make the perfect meal that will blow everyone away causes some crazy anxiety in me when it comes to holiday meals or entertaining. I’ll spend hours looking at recipes trying to decide if it’s the right one or what I could do to make it better, then change my mind five times before settling on something. I’ll even wake up at night and think of something to make, then not be able to fall back to sleep. Clearly I have issues and need to relax. Generally what happens is that the simplest and least complicated dishes that I make are the ones that everyone loves the most. 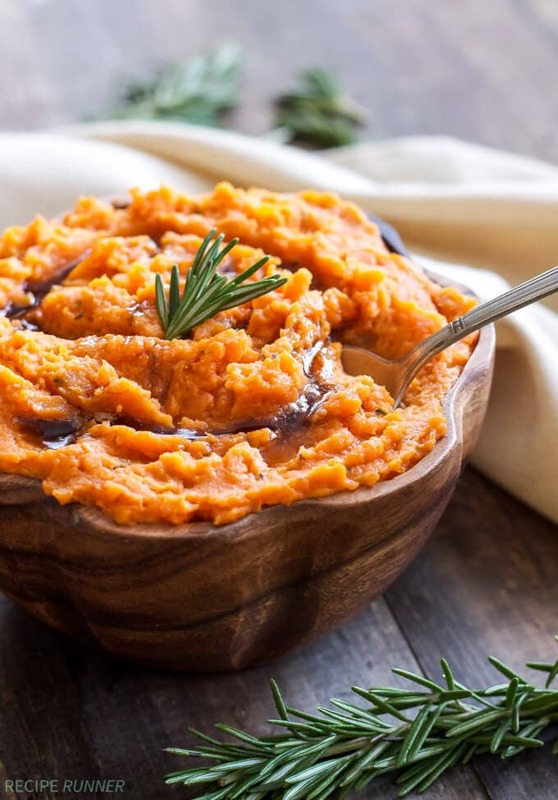 These brown butter and rosemary mashed sweet potatoes are a perfect example of that. 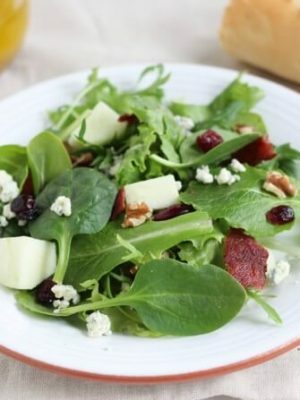 There are only four ingredients needed to make them (not including salt and pepper), but together those four ingredients create one heck of a flavorful side dish! Most people only think of making sweet potatoes even sweeter with marshmallows, brown sugar, and streusel on top. I however prefer to keep them savory. I think it really let’s to you taste the flavor of the sweet potatoes without overwhelming them with all that sugar. The brown butter adds a delicious nuttiness while the rosemary adds a fresh herb flavor. Combined with the natural sweetness of the sweet potatoes, this combination of flavors is sure to win the hearts of your family and friends! Wash and peel the sweet potatoes, then cut them into chunks and add them to a pot of water. Bring the potatoes to a boil and let them cook until tender. While the potatoes are cooking, mince the rosemary and brown the butter. When the potatoes are fork tender, drain them then return them to the pot. Add in the salt, pepper, minced rosemary, milk and brown butter. Use a potato masher to mash them to your desired consistency. 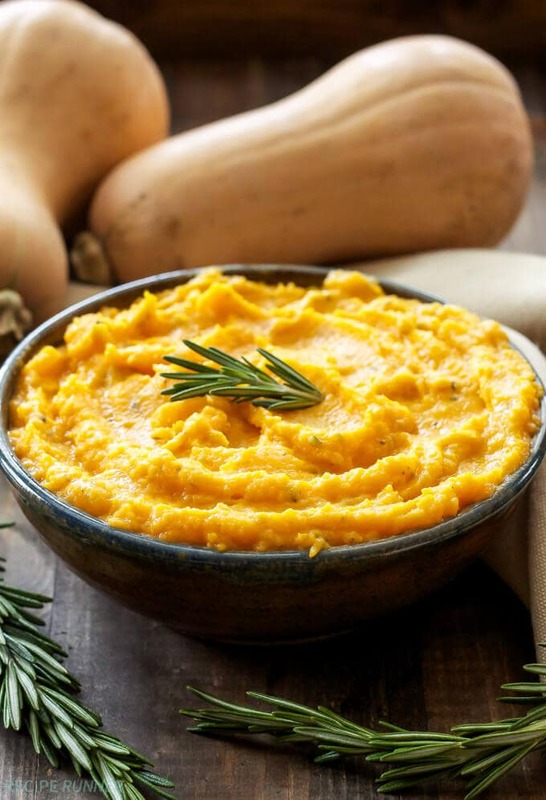 I'm a sucker for mashed sweet potatoes, but I usually go for the sweet variety. Love this version though and I'm sure the Rosemary adds the perfect touch! This looks fantastic!!! In fact, I loved it so much that I featured it today! Thank you for linking up last week to Creative K Kids' Tasty Tuesdays. I have pinned your post to our Tasty Tuesdays Pinterest Board! I hope to see you again this week! Brown butter anything is awesome but mixed in with sweet potato well that is just yum. 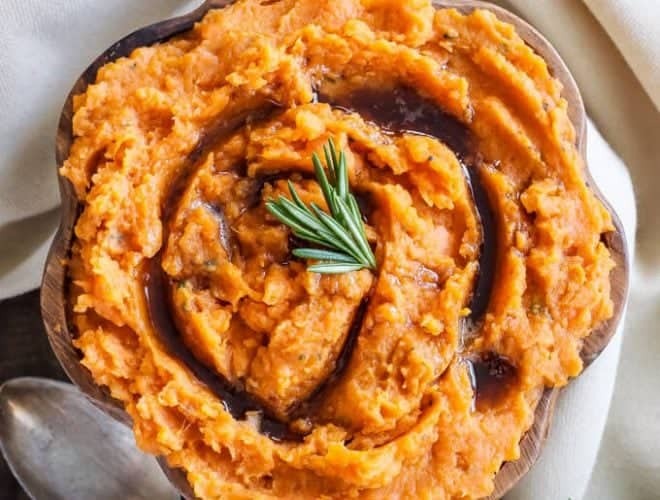 I am so with you, I like my sweet potatoes to be savory! These look INCREDIBLE!! Love love love the looks of these. Happy Thanksgiving! 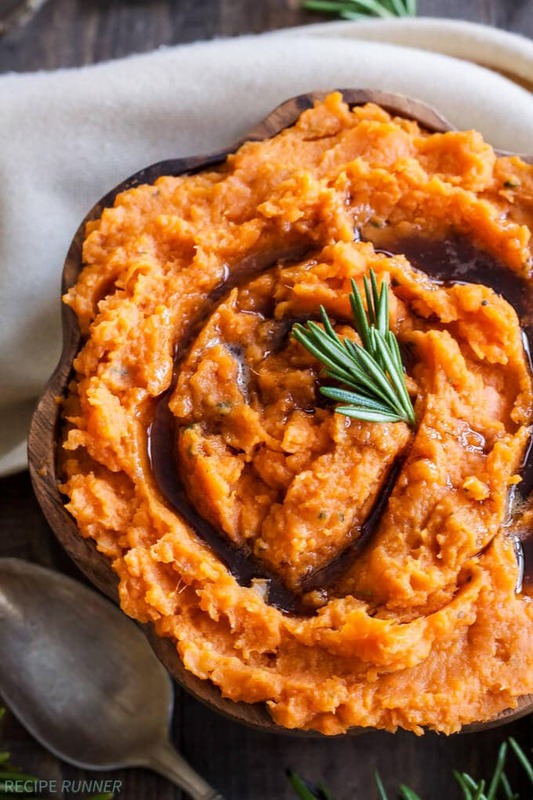 Wow Danae, only you could make mashed sweet potato look so darn good! Brown butter? Its genius! I can't wait to try these! Gorgeous presentation! pinning and sharing! 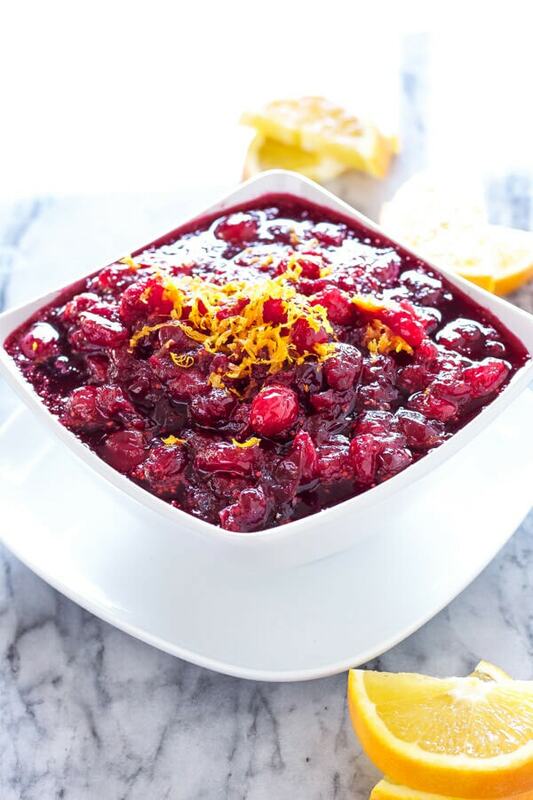 This is a perfect dish to grace any holiday table! Thank you so much for taking the time to share it with us at Snickerdoodle Sunday! Have a fabulous Holiday! 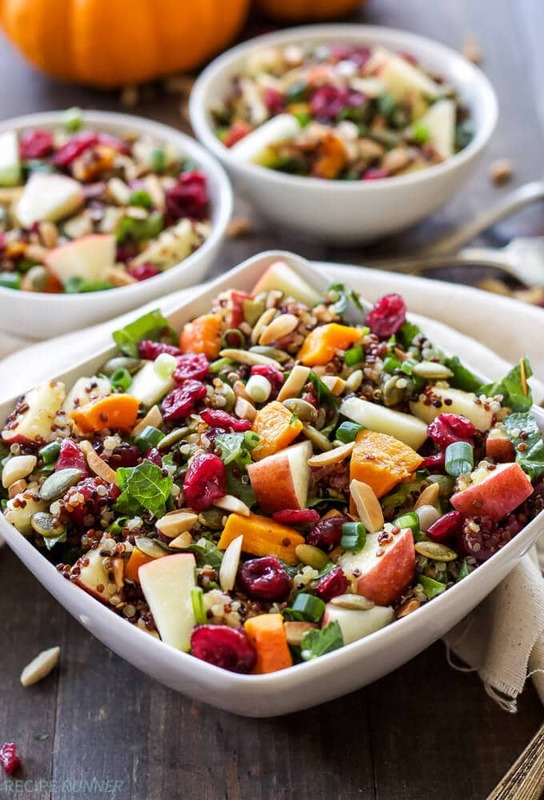 These sweet potatoes are positively gorgeous Danae! Love that you added rosemary for flavor. looks amazing thanks for sharing on craft schooling Sunday! Rosemary goes so well with sweet potatoes! This looks awesome Danae! OMG, Brown butter anything makes me swoon and these mashed sweet taters look amazingly delicious! LOVING the rosemary in here too! Honestly I could just eat a vat of this mash and be perfectly content! Pinned! Cheers to you both! This looks like a fantastic Thanksgiving side! I love that there is brown butter in this! What a great idea for Thanksgiving! 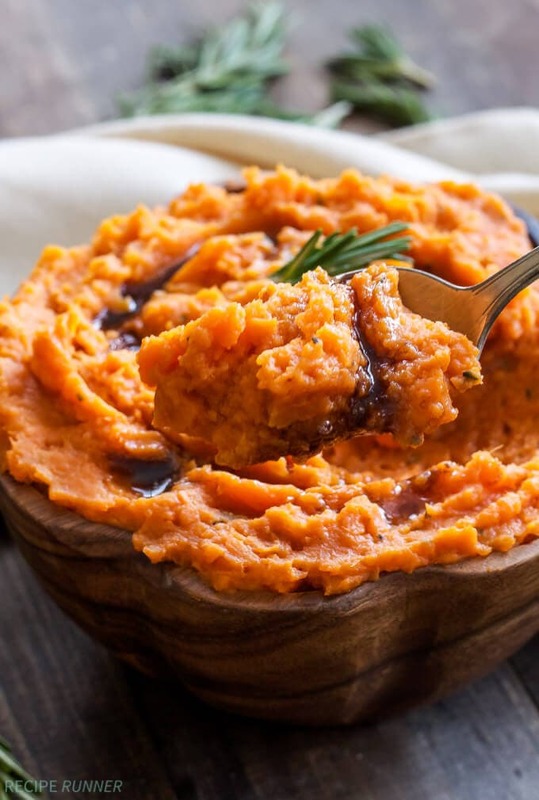 This mashed sweet potatoes looks so delicious!Thanks for sharing. Happy Thanksgiving! Mmmmm, this looks so delicious, gorgeous, and full of awesome flavors Ashley. Love the addition of rosemary here! Sweet potatoes are my jam!! I just know the browned butter made these extra special. I'm smitten!! 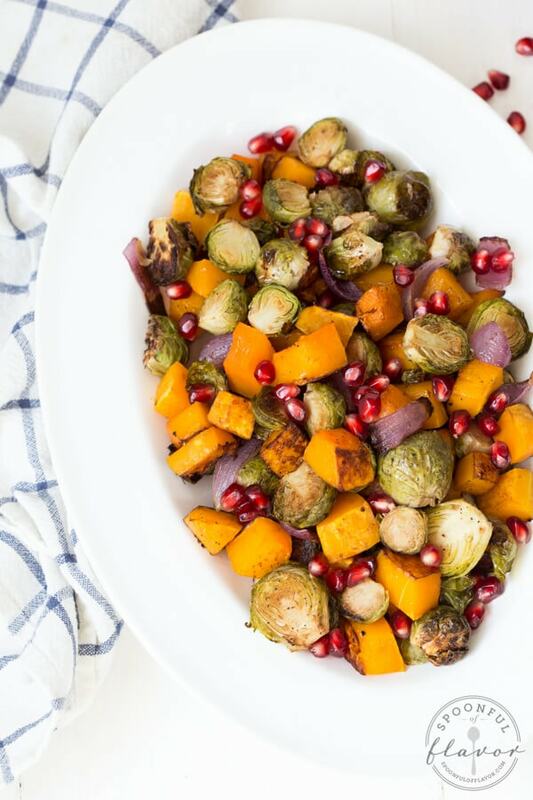 These are some seriously gorgeous sweet potatoes, Danae! Browned butter and rosemary go hand in hand as one of my fav combos and I for REAL want these sweet potatoes for Thanksgiving!